By Alex Marcondes. Aug 9, 2015. 9:00 AM. For many, the allure of fishing is its contemplative nature. No other sport allows the mind to wander for so long, nor do they offer environments conducive to this. This was certainly not lost on Izaak Walton. His The Compleat Angler is a definitive exploration of both the technique and emotion surrounding the sport. For collectors of fishing literature, The Compleat Angler is essential, and its numerous and interesting editions merit our attention. It would seem that we would miss an important part of the spirit of The Compleat Angler were we to see it as merely an exploration of fishing. The contemplative nature of the sport mentioned before, extends into the core encouragement Walton endorses. David James Duncan, in The River Why, describes it so: "Its deepest raison d'être was not love for Angling, but love for that nebulous Personage men called God." And he is not alone in this view. Washington Irving too, inspired to take up the sport, found himself frustrated that he didn't enjoy it at all and instead spent the day reading Walton's book by the river which in turn encouraged the very same contemplation on God and the world around him that so often accompanies narratives of angling, "satisfied that it was [Walton's] fasinating vein of honest simplicity and rural feeling that had bewitched [him] and not the passion for angling." Through The Compleat Angler, Walton promotes pastoral contemplation, and uses angling as a vehicle for it. The Compleat Angler has an interesting history of publication. Walton constantly added to the book until he passed, with no less than four more expanded editions being released within twenty-three years of its initial publication, growing the book from thirteen to twenty-one chapters. Each addition continued the book's narrative-driven exploration of new fish and the details on how to fish for them — a discourse between Piscator, Viator and Huntsman — further allowing for the meandering contemplation of the reader. Charles Cotton appended his own additional chapters to the fifth edition, continuing the discussion of fish, locations, and method. Most copies of the fifth edition also include a brief preface by Richard le Gallienne and biography of the author by Geoffrey Keynes. Reading the book in pastoral environments that mirror those in the book seems to be the recommended approach. For collectors, this might be a hard thing to confront: we often love our books in too specific a way to bring them out to a riverside! However, thrift editions, which are often rather unfortunate objects of poor construction and design, make for an acceptable copy for reading, and we also don't have to worry if said reading copy falls in the mud. For the collector who concerns herself with illustrated editions, however, The Compleat Angler is prime territory. Everything from engraved plates, photogravures and sketches have been included in editions of the book, even as early as 1653, where an unidentified illustrator opened the first edition with dolphins and attended to the text with several illustrations of the fish discussed by Piscator. Samuel Wale produced the most ubiquitously used illustrations in 1759. These were used continuously through to the end of the 19th century. Included were fifteen plates, seventeen small fish within the text and two sets of musical notation to accompany some of the poetry. A particularly beautiful edition including Wale's illustrations was printed by C. Mercier and Company in 1808 for a Samuel Bagster — Bagster famously printed the first affordable polyglot bible in the United Kingdom — with gilt paneled and tree-calf treated cover boards and gilt lettering and detail on the cord raised spine. A second edition from 1815 was printed for Bagster and is likewise a visual treat, with marbled page ends, an especially satisfying detail for a prominent display. 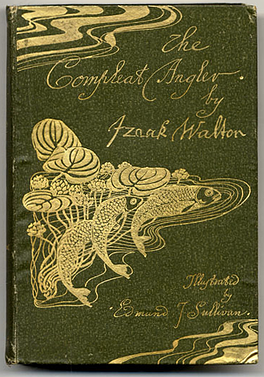 Late in the 19th century, Edmund J. Sullivan produced no less than eighty-eight woodcuts for The Compleat Angler. 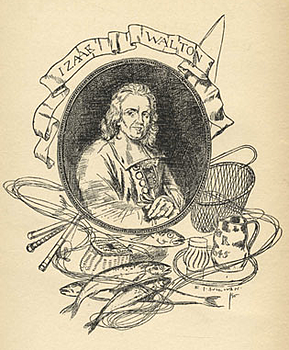 The edition includes Charles Cotton's addition to Walton's original text, detailing more fish and techniques not covered by Walton. With gilt illustrated cloth boards, it makes for an impressive front facing displayed book, its cover hinting at the myriad of illustrations kept between it's covers. The famed Arthur Rackham is also included in the list of illustrators for this book. His seem to capture the pastoral intentions of the book most excellently, with depictions of various sorts of people enjoying the riverside, performing for each other, and having seemingly relaxed discussion, the sort that allows one to explore and entertain the simpler modes of life which are a privilege to enjoy. George G. Harrap & Company produced signed and hand-numbered editions limited to 775 copies. The simple bone white vellum is paneled with two thin lines, surrounding the title, author, and illustrator. The text on the cover is pressed with a rather strange, yet striking unidentifiable, typeface. Finally, for the collector concerned with book club series, the now defunct Heritage Press produced an edition with illustrations by Douglas W. Gorsline, notable for his extremely successful illustrations of the The Night Before Christmas. This also includes Cotton's additions as well as an introduction by James Russell Lowell. As with all Heritage Press editions, The Compleat Angler was limited to a small run and corresponded to a Sandglass pamphlet detailing the book's historical context, a biography of the author, and an evaluation of the illustrator's work as a whole.